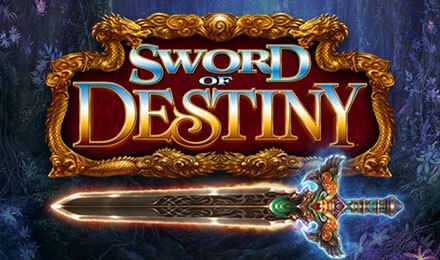 Sword of Destiny slot is a 5 reels and 25 paylines game which has been created by Scientific Games. The game is themed around a battle between evil and good, which are at war to rule the lost kingdoms. Now access this game at Moon Games Casino, where you could come across symbols like: Sword Men, Armor Ladies, Sword Ladies, Castles, Flasks, Gloves, Necklaces and Scrolls. You aim would be to form winning combinations, with three or more identical symbols on active paylines. On the Bet Field, use the plus or minus buttons to adjust the stakes to your liking. The other game option you could take advantage of on Sword of Destiny slot is the Autoplay option! Use this option to set the game to auto, and play the game hands free! Bet Levels: No bet levels available. Amount of Paylines Selection: All paylines are fixed and cannot be changed. Coin Values: Bet values range from £0.40 to £360.00. The wild card is the Sword, which substitutes for any other symbol to help form winning combinations. This replaces all other symbols except the bonus symbol. These symbols are the XZone and Glowing Coins. When three or more symbols land anywhere on the reels, eight free spins are awarded. The maximum multiplier of 10x is applied to any wins generated from the bonus round. Every scatter landed during the play of the feature awards extra spins. Clumped Wilds: Up to 3 reels are filled with the expanded wild Sword. Random Wilds: 4-9-reel positions turn Wild. Picture Wilds: Large Wilds cover adjacent reels. Upgraded Symbols: At least 2 lower value symbols upgrade to higher value symbols like Sword Man, Sword Lady or Castle. Three Glowing Coins on reels 1, 3 and 5 triggers the Jackpot Feature. A ladder appears on the screen where you get three picks from 20 coins. The higher you move up the ladder, the higher the jackpot you trigger will be.